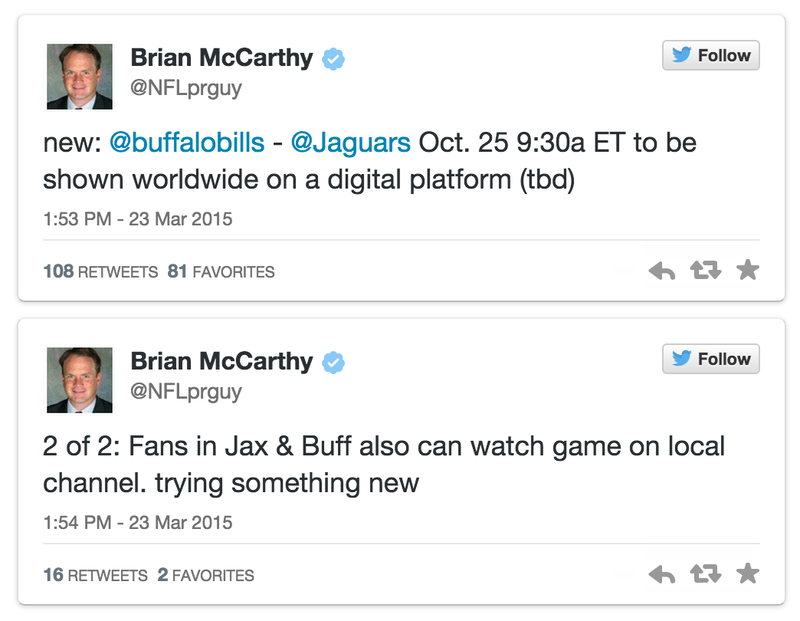 On October 25th, 2015 the Buffalo Bills will take on the Jacksonville Jaguars in London, England. This will be a monumental game in the history of the NFL because it will be the first game live streamed over the Internet on YouTube, Facebook or another Internet property. This has never been done before and it is a sign of things to come for the NFL and their broadcasting contracts. In 2011 the NFL met with Google before signing with DirecTV. The NFL Sunday Ticket has been on exclusively on satellite TV for several years but that may be changing in the near future. Now that Google and Facebook have billions of dollars to spent on broadcasting rights there is a good chance we will see more NFL games offered through live streaming broadcasts online. The proliferation of smartphones and tablets allows the NFL to look at many options when it comes to broadcasting games. It is important to note the Buffalo Bills vs Jacksonville Jaguars game is a 9:30 am EST game and would likely have one of the lowest ratings of the year even if it were on Fox, NBC or CBS Sports. Both of these teams have struggled greatly in the last several years and have seen blackouts in local markets. I doubt the NFL would be willing to try this if it were the Colts vs Seahawks or Patriots vs Cowboys. In fact, I know they would not be willing to try it. That being said, this will be an interesting test for Google or Facebook. My bet is that Google will snag this game and will broadcast it live on YouTube. They will promote on the front page of Google.com and will make certain every YouTube user knows they can watch the game for “free” on YouTube.com. You may be wondering why Google will pay millions of dollars to broadcast a single NFL football game that is not highly anticipate. Advertising dollars my friend. If Google can create a relationship with the NFL now they will likely be in the driver’s seat to get NFL games in the future. With over ten million people watching the more popular NFL games each week this would be huge ad dollars for Google. Either Google or Facebook would consider this game a loss leader. They will lose money on the first game but it will allow them to establish relationships that will make billions of dollars down the road. It will be interesting to see how this develops. I predict we will see many sporting events streamed live on YouTube or Facebook in the very near future. Pay Per View events like UFC and major boxing matches are already available on YouTube and other streaming outlets so it is all in due time before YouTube offers NBA, NHL, MLB and NFL games for diehard fans to watch from the palm of their hand on in their lap. DUI Lawyers See Google Local “Pack” Search Results Return in March 2015 | Will YouTube or Facebook Live Stream NFL Games?